Camille Pissarro (1830-1903), Chestnut Trees at Osny (c 1873), oil on canvas, 65 x 81 cm, Private collection. Wikimedia Commons. Introduction – a broad survey from Rubens to van Rysselberghe. 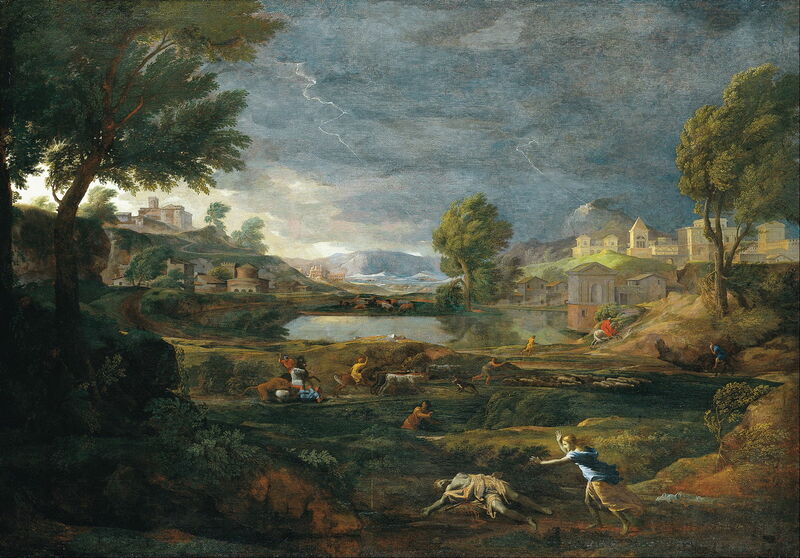 Nicolas Poussin (1594-1665): one of the founding fathers of landscape painting, most of his landscapes straddled genres and few are dominated by trees. He did, though, paint many magnificent trees, particularly his favourite oaks. In contrast to his successors, he seldom painted trees which were overtly damaged, or the hulks of old or dead trees, but idealised his landscapes in every respect and aspect. He used gradation in detail to give the impression of depth, effectively defocussing foliage as it receded into the depths of the view. This anticipated similar depth of focus effects in photography by two centuries. Article. Jacob Isaackszoon van Ruisdael (1628/9-1682): a Master landscape painter from the Dutch Golden Age with a great fondness for trees, particularly ancient oaks which had been battered, twisted, and lost their crowns long ago. His paintings of trees are well-perceived and accurate, and were a great influence on many artists, including Gainsborough and Constable. With his concentration of such old oaks, his paintings also provide a unique window through time, back to the Middle Ages. Article. 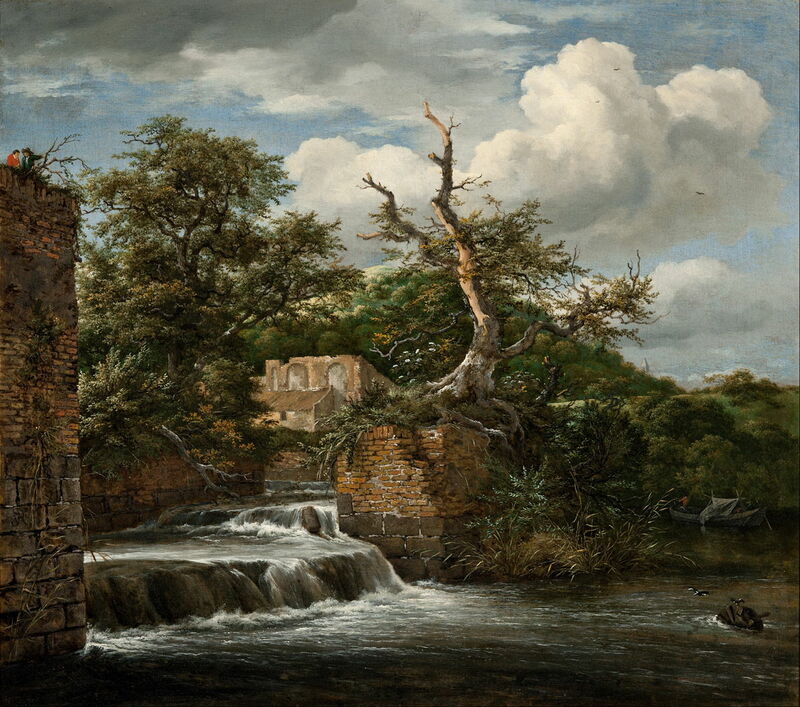 Jacob Isaakszoon van Ruisdael (1628/9–1682), Landscape with a Mill-run and Ruins (c 1653), oil on canvas, 59.3 x 66.1 cm, Art Gallery of South Australia, Adelaide. Wikimedia Commons. Thomas Gainsborough (1727–1788): originally this famous portrait artist set out to paint landscapes, which he continued to paint throughout his career. 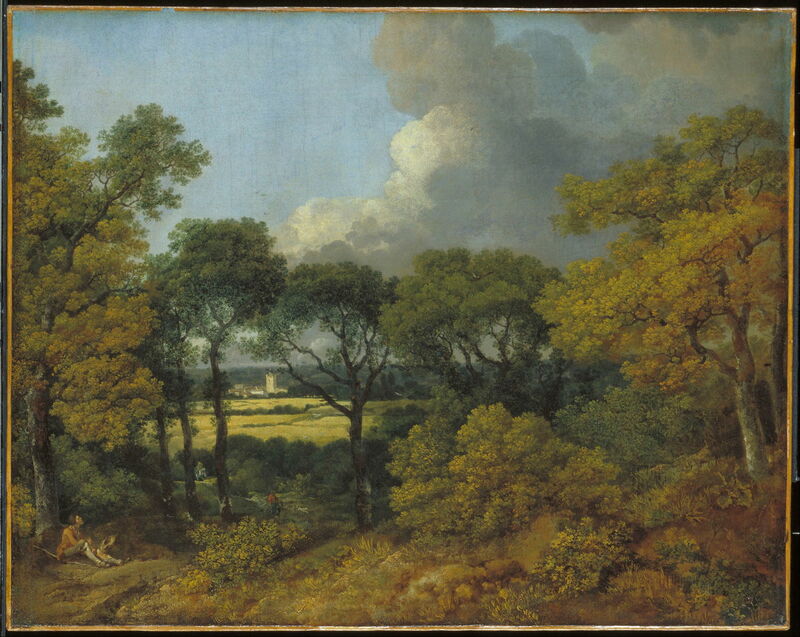 Trees were an essential part in his landscapes, and several of his paintings are among the finest examples in British art. He had recurrent themes in which canopies of trees and the form of clouds were associated, and often included the twisted hulk of a tree in the foreground. He was Constable’s muse, and co-founder of the British school of landscape painting. Article. John Constable (1776-1837): throughout his career he placed great importance on the depiction of trees. Later they tended to become affected by a ‘romantic’ tendency and over-wrought. His loose painterly sketches form a bridge between the old (Gainsborough) and modern (Impressionism). He remains one of the greatest exponents at painting trees. Article. 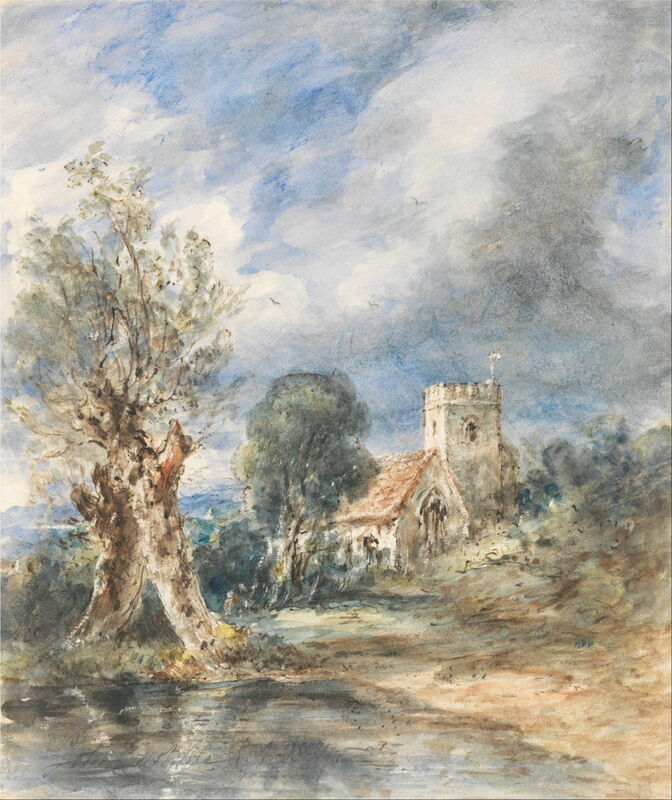 John Constable (1776–1837), Stoke Poges Church (1834), watercolor with pen and dark brown ink and scratching out on medium, smooth, cream wove paper, 21.6 x 18.1 cm, Yale Center for British Art, New Haven, CT. Wikimedia Commons. 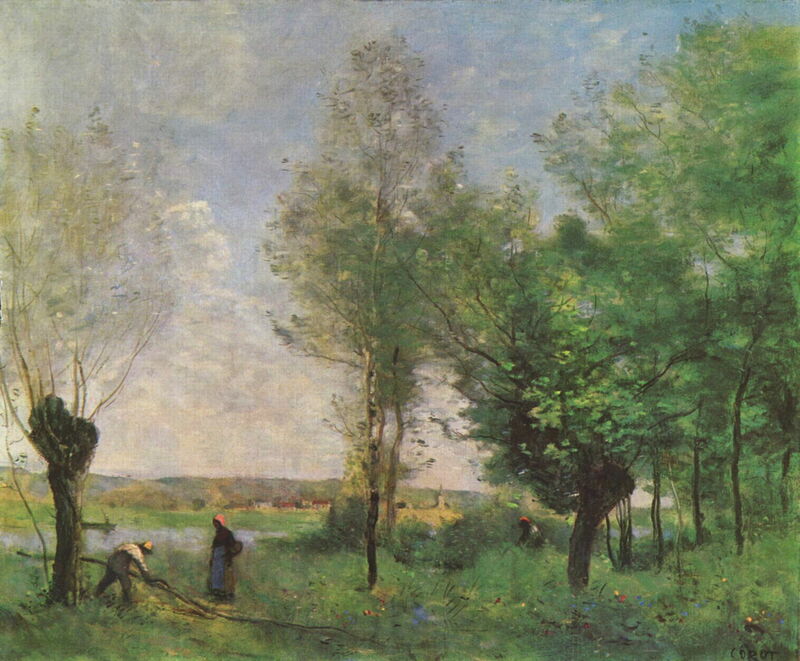 (Jean-Baptiste-)Camille Corot (1796-1875): he probably painted more trees than any other artist, and his style evolved throughout his career. Early trees were constructed anatomically and appeared quite classical. Later his marks became looser and more gestural. During the final 25 years they assumed a characteristic style with foliage made up from a wide range of marks including broad and fine brushstrokes, dots, dabs, and daubs. 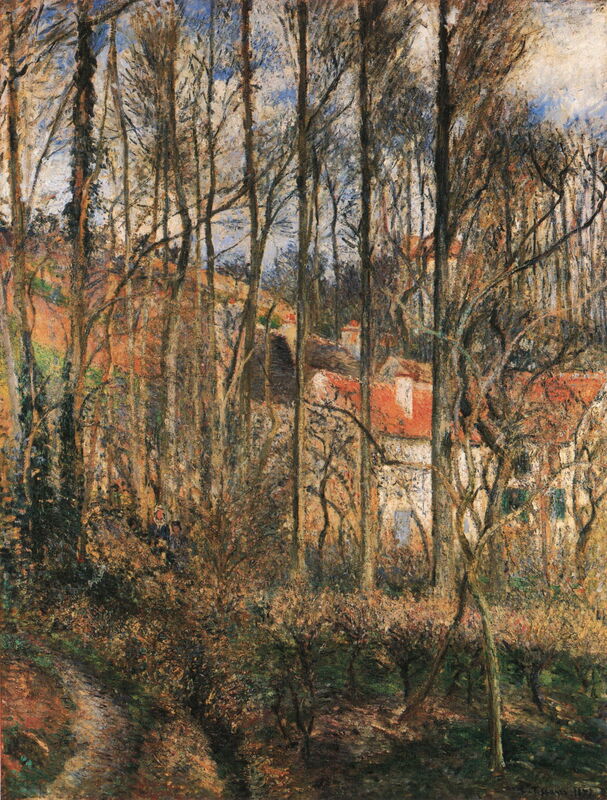 He acted as the crossroad to ‘modern’ art, following the plein air tradition of Valenciennes, and teaching Pissarro. He also appears to have been the first to use grillage. Article. (Jacob Abraham) Camille Pissarro (1830-1903): he brought the depiction of trees from realism to Post-Impressionism. Grillage, in which trunks and branches cross most or all of the more distant motif, is a characteristic of many of his paintings. In his later works trees are constructed from fine brushstrokes of bright, rich colour, and he sometimes orientated his brushstrokes into swirls and whorls. As the senior Impressionist, he was a major influence over Impressionist and Post-Impressionist landscape painting. Article. Camille Pissarro (1830-1903), Côte des Bœufs, Pontoise (1877), oil on canvas, 114.9 x 87.6 cm, The National Gallery, London. Wikimedia Commons. Paul Cézanne (1839-1906): as his style departed from Impressionism, he assembled foliage from colour patches using his characteristic constructive stroke, made of parallel brushstrokes usually laid diagonally. Ultimately his oil paintings showed a breakdown in form, but his watercolours used drawn outlines with bright flares of colour within. Although he insisted that he was painting from nature, his paintings inspired modernist abstraction. Article. Paul Cézanne (1839–1906), Grand pin et terres rouges (Large Pine and Red Earth) (1890–95), oil on canvas, 72 x 91 cm, Hermitage Museum, St. Petersburg. Wikimedia Commons. Alfred Sisley (1839–1899): sadly neglected now, he was the most dedicated landscape specialist among the French Impressionists, and was devoted to plein air painting. In his mature style, his trees have careful anatomical construction, with fine brushstrokes of contrasting colours and tones. These produce rich bark textures, and fine granularity throughout the foliage of the canopy. His series of the poplar avenue at Moret-sur-Loing is without equal. Article. 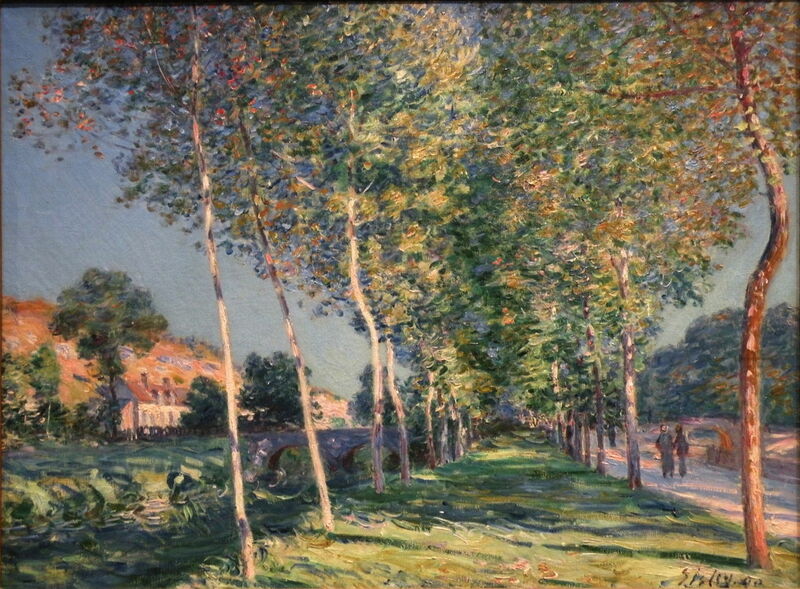 Alfred Sisley (1839–1899), The Lane of Poplars at Moret-sur-Loing (1890), oil on canvas, 62 x 81 cm, Musée d’Orsay, Paris. EHN & DIJ Oakley. Claude Monet (1840-1926): although he concentrated on parks, gardens, the sea, and inland waterways, he painted many superb works featuring trees. 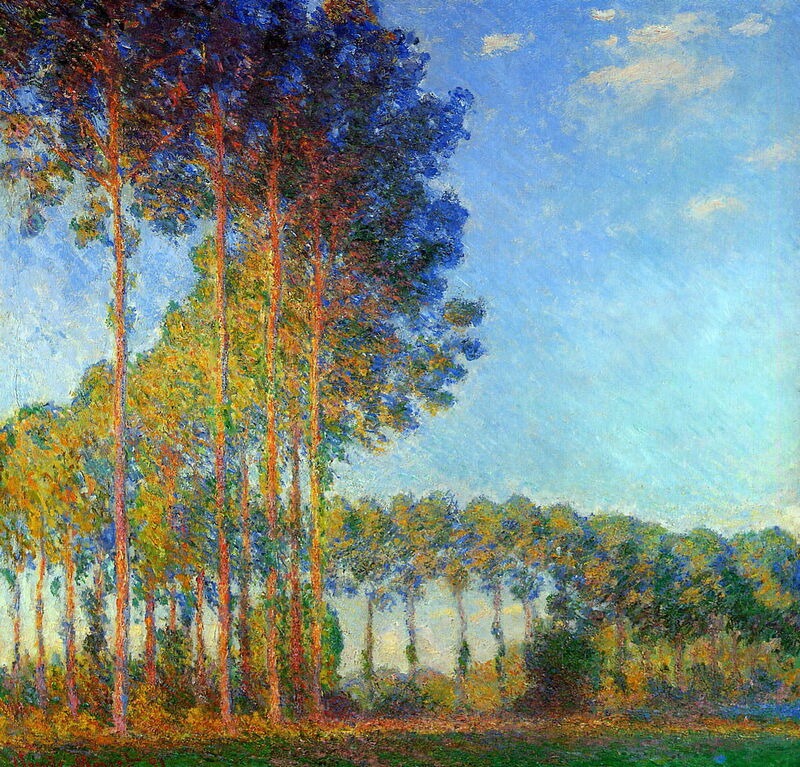 These included semi-tropical species on the Mediterranean coast, and most famously several series of poplars near his home at Giverny, between 1887 and 1892. Among those are some of the finest Impressionist paintings of trees, exploring form, colour, and multi-level composition. Article. Claude Monet (1840-1926), Poplars on the Bank of the Epte (1892), oil on canvas, 88 × 93 cm, Private collection. Wikipaintings.org, via Wikimedia Commons. 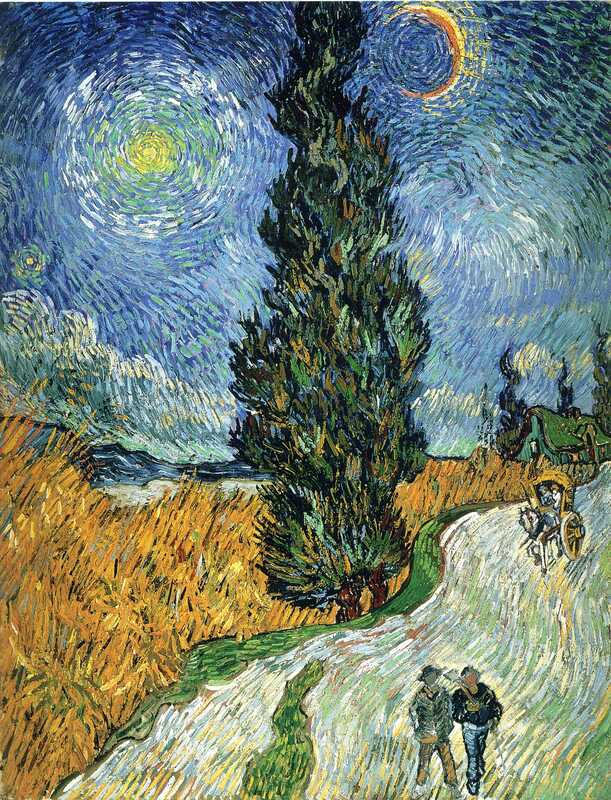 Vincent van Gogh (1853–1890): his career as an artist was brief, intense, only successful long after his death, but of enormous influence. 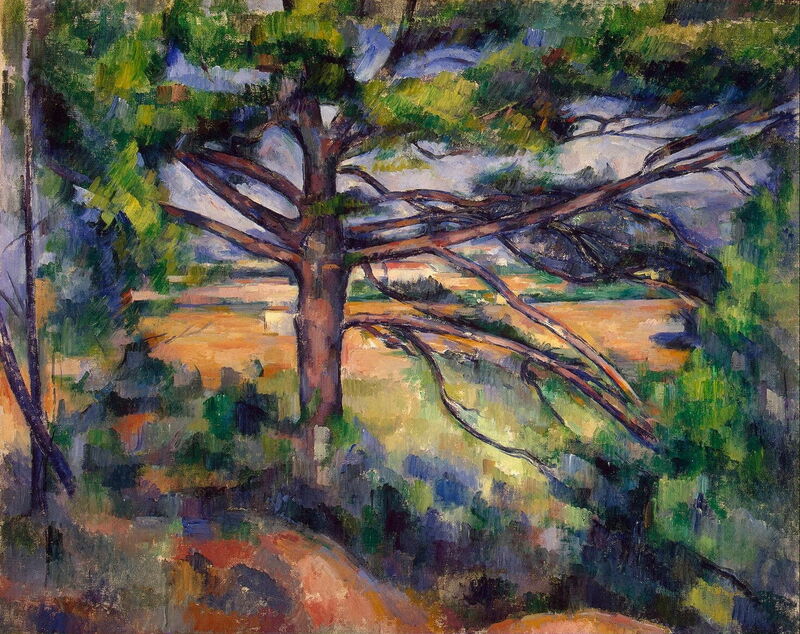 His style of painting trees developed to arrays of brushstrokes, orientated according to the tree’s form and texture. His series of fruit trees in flower, olive trees, and cypresses are exceptional, with the latter two standing as some of the most remarkable by any painter. Article. Théophile (Théo) van Rysselberghe (1862-1926): best known for his figurative painting, his styles evolved from realism, through impressionism and Neo-Impressionism, to Post-Impressionism. His Canal in Flanders (1894) is a Neo-Impressionist masterpiece, a study in poplars, perspective, and reflections. He also painted a series of pine trees on the Mediterranean coast, usually with a beach and bathers, the last of which he completed shortly before his death. Article. 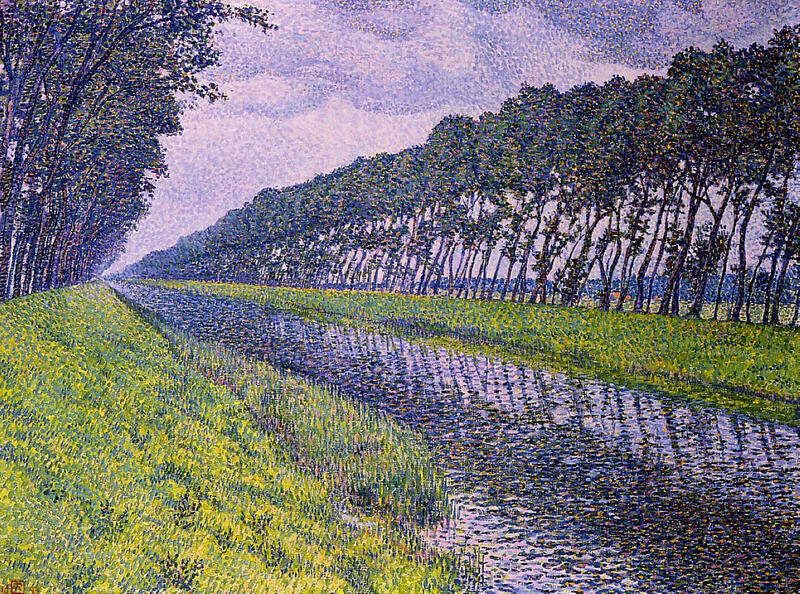 Théo van Rysselberghe (1862-1926), Canal in Flanders (1894), oil on canvas, 152.4 x 203.2 cm, Private collection. WikiArt. Posted in General, Painting and tagged Cézanne, Constable, Corot, Gainsborough, index, landscape, Monet, painting, Pissarro, Sisley, trees, van Gogh, van Rysselberghe. Bookmark the permalink.